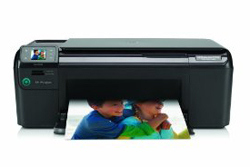 Printer Comparison has reviewed the HP Photosmart C4780 All-in-One printer. The HP printer is supposed to have fast print speeds, Wi-Fi connectivity and laser quality outputs so it will be interesting to see how it performs in real life. Printer Comparison ends up giving the HP Photosmart C4780 a good review as this printer works great at the marked it is targeted at – students. There are a couple of downsides like slower print speeds than advertised and that the sharpness of the prints could be better. Overall the C4780 seems like an excellent printer for students and other people on a budget, but not the right printer for professionals. Read the full review of the HP Photosmart C4780 All-in-One printer here.